Plugging away since 1986, Italy’s Extrema has transformed beyond their thrash origins into a more palatable groove oriented metal act without forsaking their heavy roots. 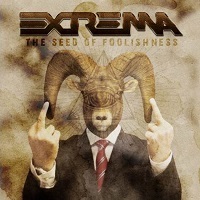 Their sixth full length The Seed Of Foolishness is a 10-song recording chock-full of entertaining hooks, easy on the ears vocal melodies with the right chorus work to encourage sing-a-long bursts and a killer rhythm section that hones in on all the right accents to the riffing on display. Overall, Extrema maintain a tenuous line between strong riffing and hooks while leaning towards conventional American groove metal methodology- so as such The Seed of Foolishness can be a tough sell to a diverse marketplace. Paolo Crimi’s “Painkiller”-like opening double bass for “Pyre of Fire” and the immediacy of ballbuster “Deep Infection” signal evidence of talent and pro chops – I only wonder though if this genre-melding creates confusion for those who question if Extrema is a band to champion in the long haul. An album that will charge you up at your local fitness center for sure…Extrema lurks for that one breakthrough.